The West Coast kicked the season off with some surprising results. Wisconsin’s Sabrina Hoffman throws against UC Santa Barbara’s Mikaela Leslie at the 2019 Santa Barbara Invite. Photo: Graham Gerhart. It’s the dawn of a new age in Southwest women’s ultimate. UC San Diego and UC Santa Barbara have ascended to the top of the region, a return to glory for both programs. Meanwhile, Stanford has stumbled, and the middle tier of Cal Poly SLO, UCLA, and California are still defining their seasons. But the pecking order is starting to take shape with the help of a few out of region guests, many of whom made their own statements this weekend. These are the biggest takeaways from this year’s Santa Barbara Invite. If the 2018 Santa Barbara Invite was UCSD’s coming out party, this year was more akin to a victory lap. #2 UC San Diego cruised through pool play and the bracket before beating UCSB 13-9 in the final. The game was close at times but never uncomfortable for the Psychos. After graduating exactly zero seniors last year, UCSD was not only the most prepared team, they were also the deepest. Plenty of words have been written about Dena Elimelech and Kelli Iwamoto, who were both recently selected to the Under-24 USA National Team, but in the final against UCSB, it was players like Avery Jones, Leanne Go, and Rebeca Ellis that really had a chance to shine. Even though UCSD’s disciplined offense is designed to get the disc in the hands of their stars, their utility players were the ones swinging the game in San Diego’s favor. The system that coaches Carlo Mosca and Alisha Stoun have introduced was far and away the best at the tournament and gave every player on their roster a concrete role to play on every point. It was this defensive effort that put the home team up a break and put UCSD on the back foot. This also gave Julia Kwasnick, UCSB’s Player of the Year candidate, the freedom to take more risky shots, such as the two hammer assists she delivered in the first half. UCSB’s success proved to be short-lived. Their dedication to good defense couldn’t quite make up for their unforced errors and UCSD clawed back into the game. The Psychos broke three times to go up 5-3 before a long point slowed the game down considerably. A Santa Barbara player ended the point by bodying out her defender and chasing down a floaty pass, but that point exhausted UCSB’s stars, and they made it to half down 7-4. From there, UCSD took over completely and ran their offense on autopilot. UCSB continued to fight throughout the second half but were unable to earn a break. Kwasnick, Kaitlyn Weaver, and Brown all gave tremendous performances and were largely the reason Santa Barbara could trade blow for blow with UCSD in the first place. 12 teams from the West Coast made the pilgrimage to Santa Barbara this weekend. A whopping seven of them made quarterfinals. The only team outside of the Northwest and Southwest was #21 Wisconsin, who ended their tournament with an impressive third place finish. The Bella Donnas made a priority of playing early season tournaments in good weather to develop their game, so they committed to Santa Barbara, despite knowing they didn’t have the funds to pay for the trip. Madison’s fantastic ultimate community came through for them, though, and the team had their entire trip fully funded. The community’s investment paid off in a major way. After dropping their first game to UCSD on Saturday, Wisconsin’s offense flipped a switch and started tearing through the rest of their competition. “This team doesn’t take losses, with every new game we brush off the previous one and come in believing we can win,” said Bella Donna grad student Caitlin Murphy. It helped that they had powerful players on both lines. Sarah Mondschien and Brittney Kokinos played inspiring physical defense and were only overshadowed on offense by Margaret Walker and Camila Flowerman. Kokinos, to her credit, was one of the most creative throwers at this tournament, and definitely had the best pulls of the weekend. Wisconsin had a lot of veteran talent that carried them through close games against younger squads. Grad students like Caitlin Murphy and Sabrina Hoffman helped keep the energy and intensity of their team high right into bracket play. It was only when meeting a determined UCSB squad that Wisconsin struggled to gel on offense. UCSB’s play was electric that game and they caught Wisconsin by surprise early. The Bella Donnas couldn’t rally in the second half and ended their bracket run with a respectable 13-9 loss. There’s a lot for Wisconsin to be proud of this weekend. They had some statement wins over strong West Coast teams, including a victory over Washington in the third place game. This is made all the more impressive considering how many more practices their opponents had before the weekend. “Before this tournament, we only have had one practice for us to play together,” said Flowerman. If this is what Wisconsin looks like with only one practice, they’ll be truly threatening at their next tournament when they’ve managed to slot in a few more. It’s easier to flip a coin than it is to predict the potential of a team comprised mostly of rookies. In the case of #16 Washington, the team looks to finally have beaten the odds. The rookies on their team are going to be turning heads for years to come, but it’s clear that the entire team is locked in and ready for a deep push. Washington made it straight to the semifinals without a loss because of a truly cohesive team effort. Stephanie Phillips is as good as advertised, but you can count on Kate Dusenbury and 2018 Donovan Award finalist and D-III Player of the Year runner-up Haley Lescinsky to steal some of her spotlight. No player looks out of place on Washington, especially when they’re attacking downfield. They have a tendency to rely on forcing open side passes a little too frequently, but that’s nothing that can’t be fixed as the season continues. And even with a few offensive stumbles, they confidently took on their opponents and weren’t afraid to play physically if it could earn them a block. With wins over BYU, USC, Santa Cruz, and a surging UCLA, Washington no longer looks like a middle of the pack Northwest team. They could cause their fair share of upsets if they’re underseeded at tournaments. Neither UCLA nor Cal Poly SLO had a perfect weekend, but they set themselves up well for the season. Cal Poly SLO finished with a slightly better record, edging out a 15-14 win to take fifth place. SLO was reliant on powerful throwers like Autumn Barker and Thalia Ward2 to give them the edge in tight games, but it was their downfield talent that bailed them out in close games. Sherita Li, Molly Cluff, and Vanessa Beeler were good for at least one highlight play per half. #22 Cal Poly’s big shining light this season will definitely be Diana Swanson. After her sister Caroline suffered a potentially season-ending injury, Diana seems to have taken the loss personally. She efficiently earned big offensive gains for SLO Motion throughout the event. With wins over Stanford, Cal, and UCLA, Cal Poly has shown flashes of their true potential. In order to win a bid, they’ll need to avoid the Cal Poly Curse and keep their best players from injury. That’s a tough ask for a team that already relies so heavily on their top players. They also need to bring their best game to every contest and avoid more mystifying losses like the 13-7 one they took in their first game against Chicago (?!). UCLA’s penchant for close games put them within two points of victory over teams like Stanford, Cal Poly, and Washington. The scale tilted back in their favor in their second game against Stanford, which they won in hard cap. If you’re eager to buy stock in BLU, put it in your “cautiously optimistic” portfolio. You might not get a return on your investment immediately, but there’s a chance for a huge future payout. BLU were at their best with Katherine Jordak, Malia Smith, and Emily Beck out on the field. Jordak and Smith looked like they were one step away from putting the team on their back and taking over games much in the same way Han Chen did for UCLA in the past. The good news for BLU is that they probably won’t need to overplay their stars. There were some rookies that are taking on larger roles immediately, including Anna Reed, who was an integral part of their late game strategy. #9 Stanford’s fall from grace is the most shocking results of the tournament, but probably should be taken with a grain of salt. Yes, Stanford is a young team and lost a lot of talent. Yes, they have a lot of improving to do, especially on defense. But also, yes, they do have arguably the greatest coaching staff of all time. It’s a long season and the coaches will have a game plan to get the team where they need to be in time for their Conference Championships. Stanford was a little short-handed, too. Bad losses to Cal Poly SLO and UCSD may stick with them, but it’s nothing they cannot recover from with some late season heroics. Hallie Dunham’s taking on a much larger role on offense and defense and is adjusting to the responsibility. Beside her, Bridget Connor and Sarah Kratzer could also take their games to another level in a few weeks. Hold off on eviscerating Stanford until after their next tournament. All concerns could turn to ash with a quick snap of the fingers. #23 California’s weekend essentially mirrored Stanford’s, except the expectations placed on the Pie Queens weren’t quite as high. Whereas it was a shock to see Stanford fall to seventh at SBI, Cal’s eighth place finish is quite respectable. Cal’s optimism and excitable energy has carried over from previous seasons and they still look like they enjoy playing together. Even their losses are encouraging. Losing to San Diego, Santa Barbara, and Wisconsin looks pretty rosy after they all finished in the top three. Cal won the games they had to and lost close games to teams hovering around the same skill level. They’re still swimming upstream, but look reinvigorated while doing it. Honorable Mentions: Kelli Iwamoto, Brittney Kokinos, Audrey Brown, Avery Jones, Malia Smith, Autumn Barker. 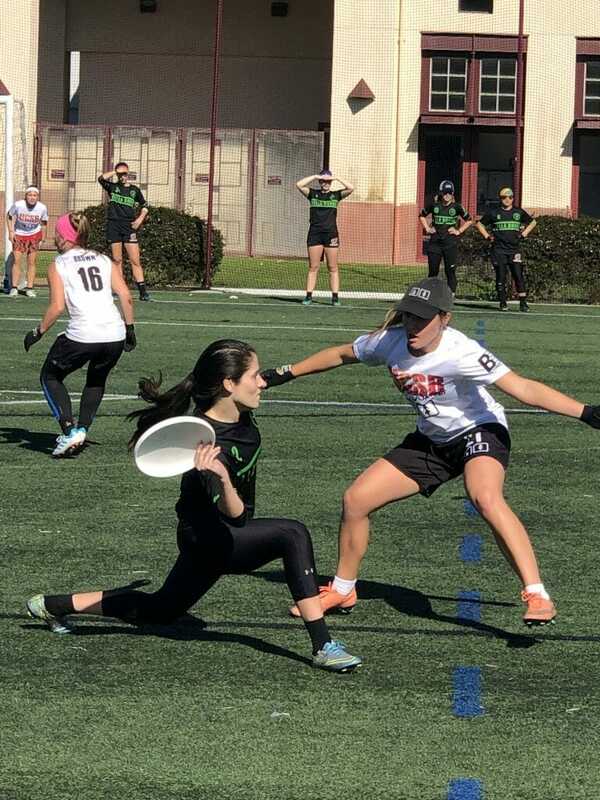 Comments on "Santa Barbara Invite 2019: Tournament Recap (Women’s)"